As Matt keeps us updated on happenings out west at the River Rally, CFWEP's resident AmeriCorp VISTA volunteer, Justin Ringsak, offers a glimpse into the world of CFWEP research projects in this guest edition of the CFWEP blog. It is amazing what you can find in Montana if you are willing to get a little sweaty tromping up and down a hillside or two. 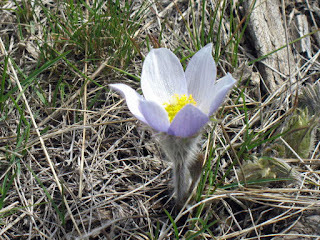 On an unseasonably warm spring Sunday in southwestern Montana, I joined Matt Vincent (CFWEP Science Coordinator extraordinaire), Bill Callaghan (Butte High School science teacher, CFWEP Advisor, Water Teacher of the Year, and generally good guy) and Butte High students Eric Henrich and Robert Carver to follow along on an expedition to track the radio-collared Bighorn sheep recently transplated to the Highlands Range south and west of Butte by the Montana Department of Fish, Wildlife and Parks. 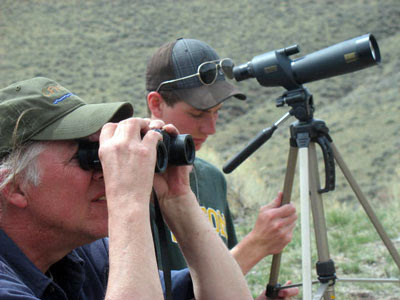 Eric and Robert are two of a group of about 12 dedicated Butte High students enlisted by wildlife biologist Vanna Boccadori. The students have been working on the project as volunteers for the past few months, heading out on weekends to see what's happening with some of Butte's newest neighbors. On past trips, car troubles have been the norm. Following the faint beeps of the radio collars requires a good deal of driving up and down some of Montana's rougher roads, and sometimes a slap from the hand of destiny will land your truck in a creek bed or blow a tire. This has been especially true when Bill has been along on the Bighorn tracking trips. But Bill and his karma (or is it car-ma?) had no part in the first car mishap of this trip, as Robert's truck started smoking on I-15 a few miles north of Divide, not ten minutes into our expedition. After some deliberation, it was decided that Robert would, unfortunately, have to head back to town to address the demands of his truck and its smoky tail, while Eric jumped into the trusty ol' Montana Tech standard-issue suburban with me, Bill and Matt. I felt a little sorry for Eric, having to put up with three so-called "authority figures" for the day, but his patience was not without its rewards. Smoking truck behind us, we drove to a hill on the west side of I-15 near Melrose. Looking back east, we had a wide early morning view of the westslope of the Highland Range, near the Camp Creek and Soap Gulch drainages. 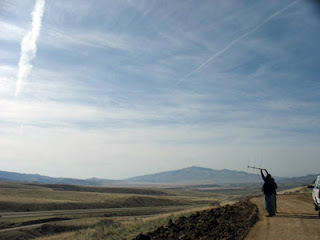 Matt and Eric alternately swung the antenna around and listened for the telltale beeps of the Bighorns' radio collars. We did pick up a few faint signals, but it was difficult to determine their direction because of bounce from the hills behind us. Undeterred, on a hunch and a tip received at a quick pitstop for caffeine in Melrose, we drove east, up into the Camp Creek drainage. It wasn't long before we started to see signs that we were in the right neighborhood. 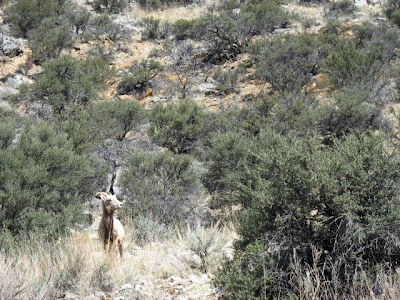 A few miles up the road, next to the Camp Creek reservoir, Matt spotted a lone Bighorn not fifty feet uphill from the road. This wayward fellow wasn't burdened by a radio collar, and he wasn't too shy, either. He patiently posed for a few photos before trotting up the road at a leisurely pace, pursued slowly by Bill and his camera. We had found a Bighorn, but not the Bighorns we were searching for. 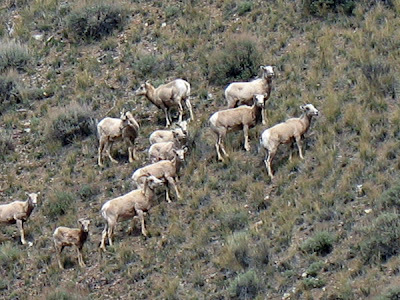 A few more rounds with the antenna and more beeps told us that we were close, but with the steep walls of the Camp Creek drainage looming around us, it was difficult to determine in exactly what direction our sheep were located. So we piled back into the trusty ol' Montana Tech suburban and continued up the road, finally emerging into a fairly wide valley that offered a nice panoramic view of the Highland peaks as seen from the west. While we took a lunch break, a red-tailed hawk glided above us, looking for some lunch of its own. 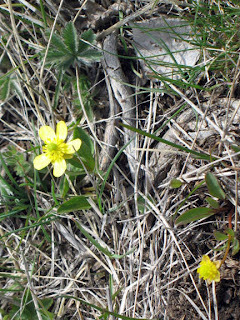 Despite the early time of the season, wildflowers also added some color to the landscape. From there we looped back to the west, heading down the Soap Gulch road, stopping at a high point to swing the antenna around yet again. The increased volume and frequency of the beeps told us that we were getting close. While we scanned, Matt spotted a coyote across the hilltop. 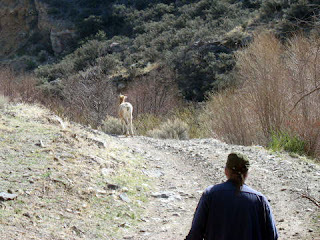 The coyote gave us a quick glance and rambled, in no particular hurry, out of sight. 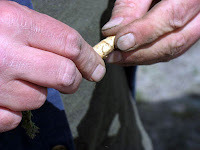 At the roadside, Bill reverted to his former life as a botanist and dug up a mushroom and a wild plant with a thick, possibly edible root. We had stumbled our way over a ton of interesting distractions, but only one lone, collarless Bighorn Sheep. After a drive halfway down Soap Gulch and still no sheep, we stopped below a rock quarry. 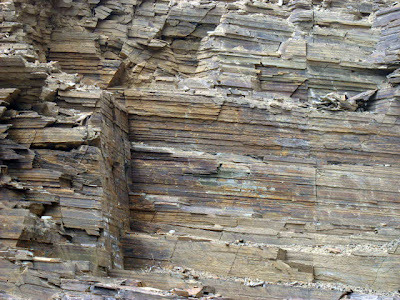 Matt and Eric scampered up the ridgeline to do another sweep with the antenna while Bill and I wandered the hillside, observing the variety of vegetation and the colorful geology revealed by the quarry. Eric and Matt confirmed that we were still on the right trail. Based on their readings, they guessed that we might have better luck if we bore north, up to the top of the ridgeline between Soap Gulch and Moose Creek. We found a road heading in that direction near the bottom of Soap Gulch; it wound up a series of switchbacks along a drainage until it reached the ridgeline. 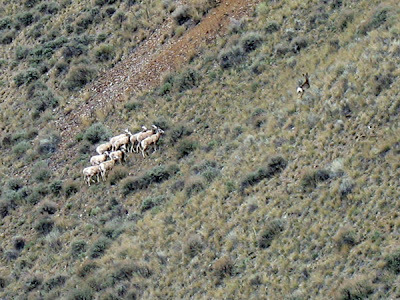 As soon as we reached the open space above the switchbacks, we caught site of a herd of Bighorns on the opposite side of the drainage, just a short distance away from where Matt and Eric had been hiking above the quarry. They had been closer than they realized. As Eric, Bill and Matt trained scopes and binoculars on the sheep to determine their numbers and how many were radio collared, I scampered down the drainage to try for some better photos. At first, the sheep kept their eyes on me as I moved, but they didn't seem too concerned by my presence. As I drew closer, a deer moving up the hill passed by the herd, keeping a wide berth. The Bighorns all turned away from me to watch this passerby- the deer must have been more interesting than me. With his spotting scope, Eric observed that three of the sheep in this herd were collared, leaving a fourth mystery signal from a sheep we couldn't confirm with a visual sighting, although it seemed likely that the mystery signal came from one of four other sheep we barely spotted higher up the hill. Vanna was particularly interested in finding two radio-collared sheep that hadn't been sighted in the last several weeks, so, with no sign of those two sheep yet, we headed on up the ridge. 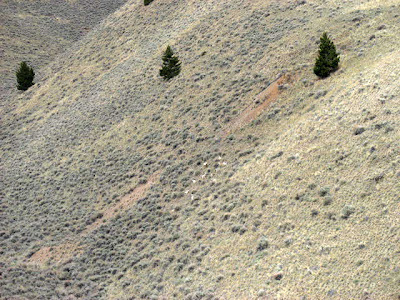 A short distance up the road we caught sight of several elk in a patch of trees. They quickly disappeared, but as we continued on Matt spotted a shape darting over the ridgeline. From the size and dark coloration, we guessed it was a wolf who had been stalking the elk. Around another bend we encountered a manhole-sized metal covering in the ground at the roadside. We had seen a few of these elsewhere along the road, and Matt decided to stop the suburban so that we could investigate. 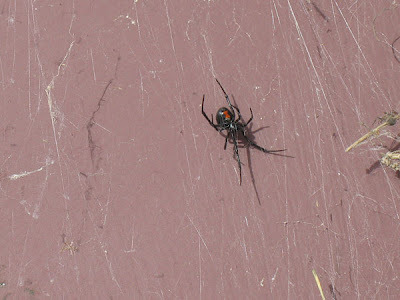 He pulled off the lid to reveal a valve on a pipeline, and, more importantly, a black widow spider who had made a home by weaving her web on the inside of the lid. The telltale red hourglass marking on her underbelly stood out against the backdrop of the lid, and, with a body roughly the size of a nickel or quarter, this spider seemed unusually large for the elevation and climate, probably a result of the luxurious hidey-hole she called home. Matt carefully returned the lid and spider to their proper position, and then it was back into the suburban as the road sloped down toward the Moose Creek drainage. But a few snow drifts gave us pause, and we finally turned around to head back the way we had come, opting to avoid the chance that Bill's karma would get us stuck in the only patches of snow we had seen all day. But the afternoon still held a few surprises. 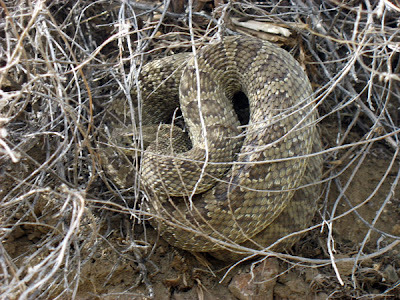 As we rolled back down to Soap Gulch road and made our way west toward Melrose and I-15, a big rattlesnake, about five feet long, slithered across the road in front of us. 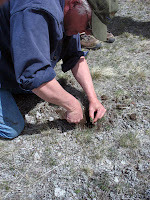 We stopped so that Matt and Bill could follow the snake into a nearby patch of sagebrush. Matt and Bill poked at the rattler with a few flimsy twigs. 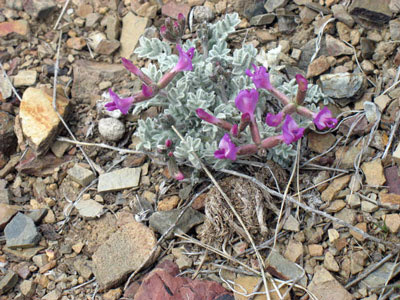 The snake wasn't too enthusiastic about all the attention, and it rose to strike a few times, but, risking life and limb, Matt managed to snap a good picture of it as it was coiled in the sage. We piled back in to the ol' Montana Tech suburban, but only made it a few hundred yards past the rattlesnake before it became clear that Bill's bad vehicular karma was still with us. The rear driver's side wheel locked up, and a bit of experimenting told us that it wasn't planning on budging anytime soon. But Bill had a guess as to the nature of the trouble- something to do with a "self-regulating brake mechanism." With no cellphone service, we decided to see what we could do. Luckily, the suburban did have a jack and a tire iron, so we raised it up and began to remove the trouble tire. But even this job wasn't without its obstacles. 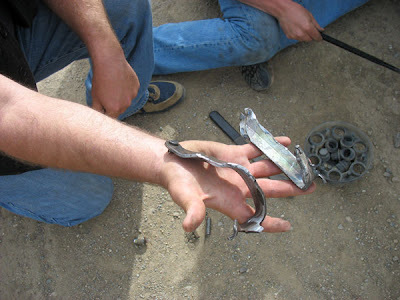 One of the nuts on the tire had been misthreaded, and it was now a permanent fixture on the wheel. Matt managed to put the stubborn nut in its place by completely twisting it off, and we were finally able to get the tire off and take a look at the wheel. It seemed that Bill's diagnosis was correct- several pieces of metal inside were bent and contorted into odd shapes, jamming up and preventing the wheel from turning. Bill assured us that they were non-essential parts, so we took out the remnants, put the tire back on (now one lugnut short), and we were on our way back to Butte strictly via frontage roads, considering the questionable state of the trusty ol' Montana Tech suburban. But it did the job- we made it back without further incident. Although we never did find the two mystery sheep, the trip couldn't be called anything but a success. That's the wonderful thing about a simple Sunday drive through the Montana backcountry- you might not find what you're looking for, but chances are good that the landscape will lead you to all sorts of unexpected wonders. oh, way to go mr vincent. nothing like antagonizing a rattlesnake and risking yourself and jeopardizing the flora and fauna for the sake of a few megapixels.....hip, hip.